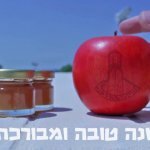 Home » About Rosh Hashanah » Why Do We Dip an Apple in Honey? An apple dipped in honey for a sweet new year. We dip an apple into honey to symbolize a sweet new year. The combination of these two sweet items, both the products of nature, offer a reminder of the inherent sweetness of the world and the desire for that sweetness to be a part of our lives throughout the year. This is a medieval Ashkenazi (Eastern European Jewish) custom that has become widespread. Both apples and honey together and separately have become symbols of the new year. 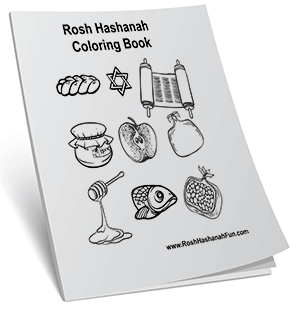 They are used in cooking and other High Holy Day imagery. 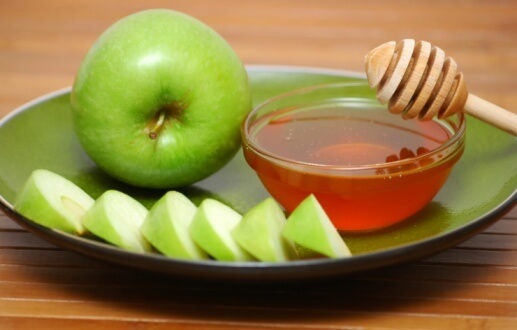 Dipping an apple into honey is also an unusual act, one that we do not usually perform at other times of the year. By doing so we set apart the holy days from the ordinary days.